Paradise on the Pecos River- 200 ft of riverfront private gated property. Very Peaceful setting - At the end of the road. Very quite road with a small group of houses. The neighbors want to keep it that way too. Great for small groups 4 people -no parties. 2 car maximum at the house. Fishing out the front door - the cabin has 200 feet of river and walking up and down river for trout fishing. Locked security gate to enter property. Incredible house to unwind, 40 minutes from Downtown Santa Fe and 1hour 20 minutes from Albuquerque. Easy fly in, provisions stop and your there. Equip with built in Vermont Castings Grill hooked up to propane tank, Fully equip kitchen, washer and dryer, wrap around deck 4 feet off the ground, another deck built right on the river with dining, full bathroom, HD television with streaming , Wifi, telephone, and radio with Bluetooth. Great hiking, trout fishing, hunting, complete RNR spot. Ive lived in Santa Fe for 30 years and really love living in Northern New Mexico. Originally I'm a Texan and have all my family there. Graduate of University of Texas in Austin. Have had many types of work, mostly self employeed - artist, restaurateur, builder... The Cabin in Pecos is a real dream come true for me and I need to share it to keep it. Its a real retreat and I hope you will enjoy it as much as I do. This River Cabin is a real retreat and a dream realized for me. Great place to unplug and watch nature. I've seen deer, sandhill cranes, lots of bird species, and the trout fishing is right in front of the door. bathroom had full size tub with shower all new connected to the down stairs bedroom. All beds will be clean and made. wifi password on the refrigerator. Dining table in side for 4 with two exta stools at the counter. Two more dining tables outside one on the deck on the house and the other on the deck at the river. Wifi - bring a laptop to stream and internet access. As well there are 3 hammocks for hanging outside and the straps for the hammocks are on the trees. We had a great time. The property is gorgeous. The cabin was lovely and fully appointed. Our daughter found a "secret room" and slept there every night. And our hosts were endlessly helpful during our stay. A very memorable trip. The property was beautiful! The house was clean & spacious & the view was amazing! We came here to celebrate my son's 16th birthday. It was everything we hoped for & more. The sound of the running river was so relaxing. My boys had fun fishing & exploring along the river each day. The patio was perfect for reading & enjoying nature. We enjoyed a fire in the fire pit each night, as well. We will be back, for sure! Great property. We really enjoyed our stay. We loved the cabin and grounds. Quiet, restful and the air was crisp and cool. Would love to return for a longer stay. Charlotte has great amenities and it felt much like “home” away from home. Great place for families and or two couples wanting to unplug from city. We couldn’t have picked a better spot for a cabin in the woods. The host was fantastic and the pictures were a true representation of the home. It was wonderful. Thank you Charlotte for sharing your home. 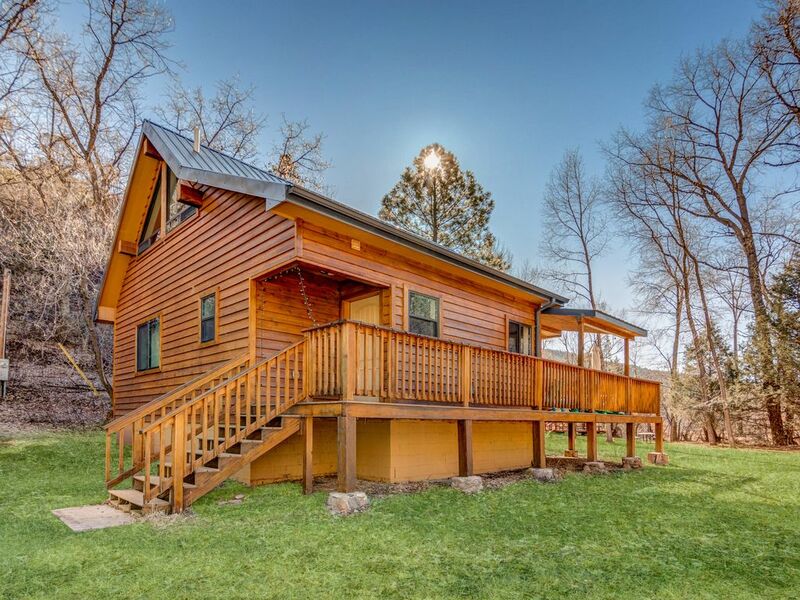 The cabin has absolutely everything you could desire. There are 2 lovely decks and many different places to relax, listen to the river and watch the clouds. Charlotte has many different games and puzzles to past the time. The cabin was very bright and sunny. I am looking forward to visiting again.